Common supplement types and brands are also available on this page to quickly search for your preferred products. You can disable this popup from appearing in your Fullscript Settings. Once you've selected a variant, you'll be able to customize the dose, frequency, and duration of the supplement recommendation. The dose is required whereas the frequency and duration fields are optional. A popup will appear with additional information on the selected supplement. 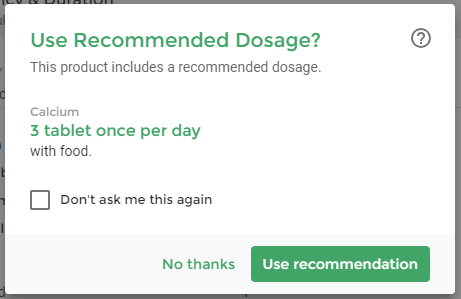 You can resize, drag and move this popup around if you need to reference the supplement details while creating your recommendation. Click the [+] button in the top-right corner of a product to add it to your current recommendation.